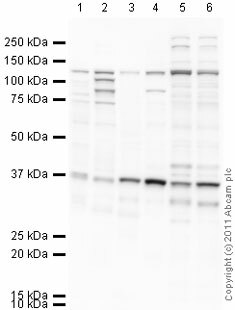 Synthetic peptide conjugated to KLH derived from within residues 200 - 300 of Mouse Dact2. WB: Use at a concentration of 1 µg/ml. Detects a band of approximately 100 kDa (predicted molecular weight: 82 kDa). Negatively regulates the Nodal signaling pathway, possibly by promoting the lysosomal degradation of Nodal receptors. Belongs to the dapper family. The C-terminal PDZ-binding motif may mediate interaction with the PDZ domains of DSH (Dishevelled) family proteins. 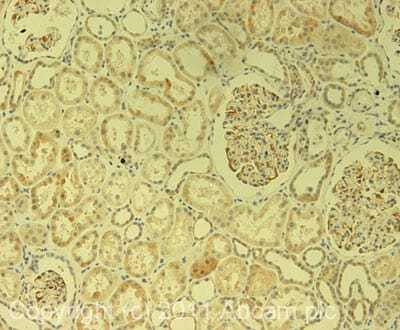 IHC image of Dact2 staining in human normal kidney formalin fixed paraffin embedded tissue section, performed on a Leica BondTM system using the standard protocol F. The section was pre-treated using heat mediated antigen retrieval with sodium citrate buffer (pH6, epitope retrieval solution 1) for 20 mins. The section was then incubated with ab42099, 1µg/ml, for 15 mins at room temperature and detected using an HRP conjugated compact polymer system. DAB was used as the chromogen. The section was then counterstained with haematoxylin and mounted with DPX. Dact2 has a predicted molecular weight of 82 kDa; however as this is a novel protein, it may contain uncharacterised modification sites that affect the migration of the protein. 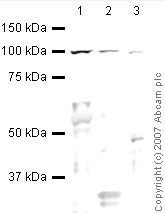 Abcam currently sell two antibodies to this target, ab42099 which detects a band at 100 kDa and ab42377 which detects a band at 115 kDa. Abcam welcomes customer feedback and would appreciate any comments regarding this product and the data presented above. Observed band size: 115 kDa why is the actual band size different from the predicted? Additional bands at: 37 kDa. We are unsure as to the identity of these extra bands. ab42099 has not yet been referenced specifically in any publications. Publishing research using ab42099? Please let us know so that we can cite the reference in this datasheet. There are currently no Customer reviews or Questions for ab42099.